Tom Montgomery sent this photo. My name is Tom Montgomery and I'm a huge fan and member sponsor of the Cavaliers. I'm also a weekly newspaper editor in Michigan, so I'm never without my camera. 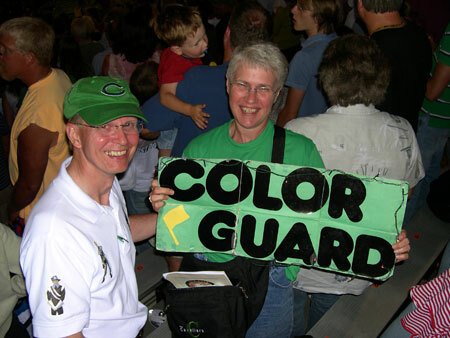 This is a photo of Roger and Mary Ellen Sanders, proud mom and dad of Cavaliers co-guard sergeant Brady Sanders. I met them in the parking lot and later sat just behind them during the Belding, Mich., show on June 24. Just wonderful folks who, although I had not met them before, last year sent me a photo of a young man I sponsored in 2006 – Assistant Cavaliers Drum Major Jordan Thomas. Anyway, we shook hands, briefly got acquainted and enjoyed a wonderful show that night.